Exclusive Chocolate Specialty Beer at Disneyland’s Ballast Point! 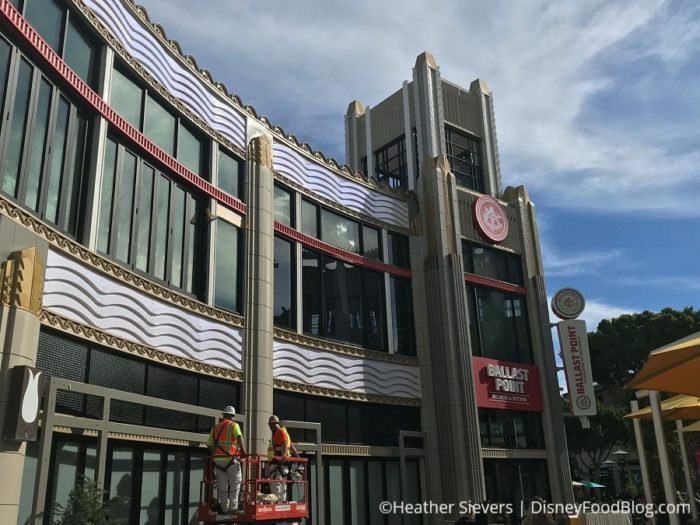 Ballast Point opened just under a month ago in Downtown Disney, making it the first on-site brewery at Disneyland Resort. 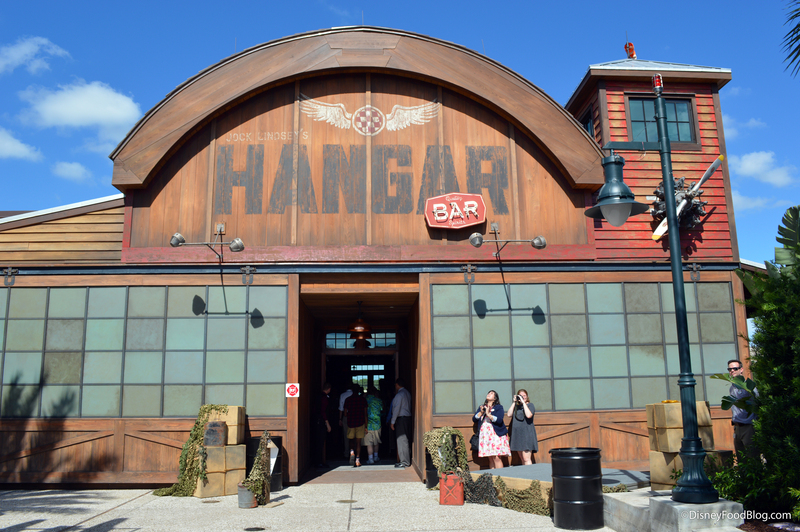 And not surprisingly this hip new spot is crafting beer just for the Disney park! They’ve produced several exclusive beers for this location, and now Ballast Point’s Instagram has highlighted another specialty Disney beer: Chocolat. and FOOD PHOTOS at Ballast Point! Photos and Review: TWO NEW Cocktails (and NEW Souvenir Mugs!!) at Trader Sam’s Enchanted Tiki Bar in Disneyland! 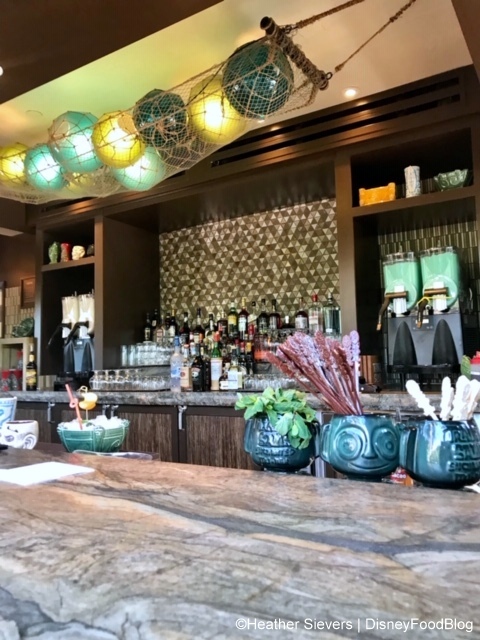 With the exciting reopening of Tangaroa Terrace Tropical Bar & Grill at Disneyland Hotel, Trader Sam’s Enchanted Tiki Bar has introduced two brand new cocktails! 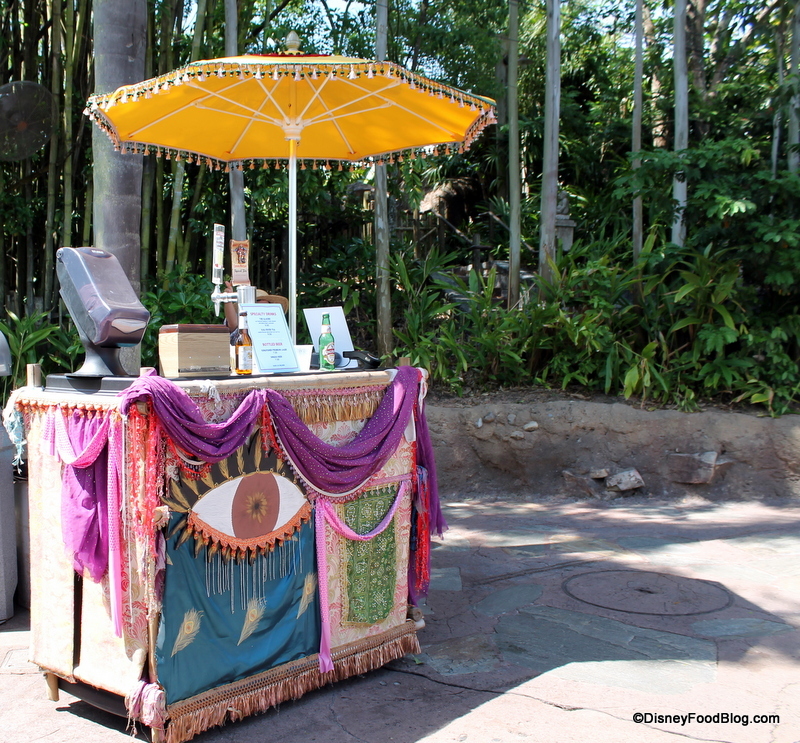 And the refreshed Tangaroa Terrace Bar & Grill also now has an outdoor bar (!!!) 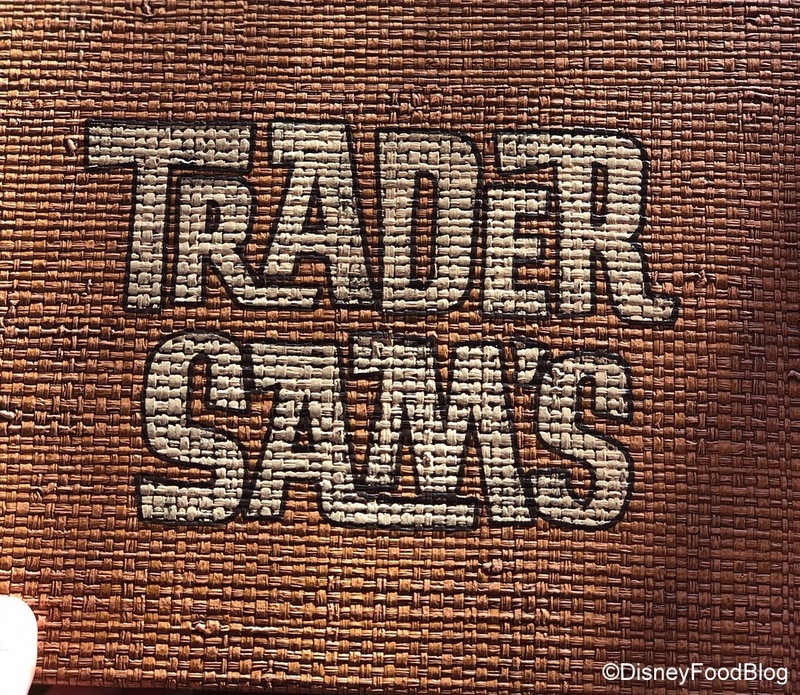 — so you can get Trader Sam’s drinks without even going into the popular tiki bar! Jock Lindsey’s Hangar Bar in Walt Disney World’s Disney Springs is an Indiana Jones-inspired bar where creatively-applied movie references are part of everything they do. From our first visit, we loved the cool space and the funky menu. And Jock’s not just in it for the clever names. Come the holiday season, they’re also in it for the seasonal drinks! During Halloween we loved the spooky drinks and the Poison Apple Glow Cubes that came with them. And for the Christmas season, Jock Lindsey’s offering two holiday libations. Review: Drinks and Bites at Animal Kingdom’s Restaurantosaurus Lounge! 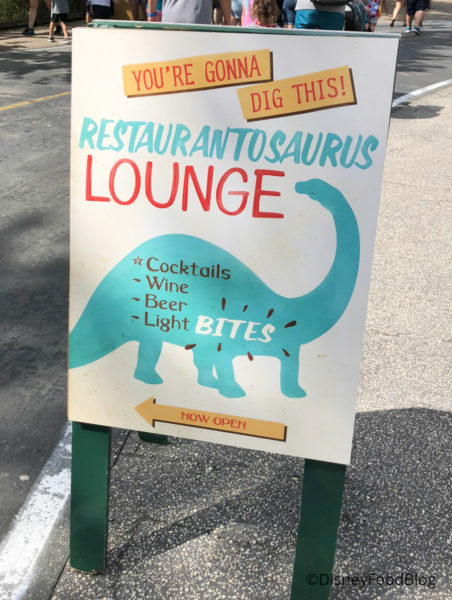 Back in July, we told you about Animal Kingdom’s newest place to chill out: Restaurantosaurus Lounge. 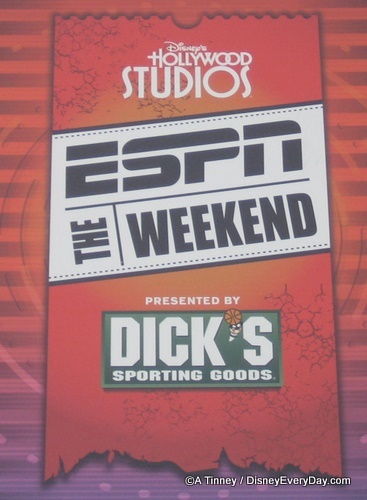 At the time, it was described as undergoing a three month trial period and had limited hours from 5PM to closing. But we loved the concept, particularly as indoor air conditioned places to rest our adventuring feet are always welcome in Walt Disney World’s largest park. That said, as much as we love the concept, sticking a “lounge” in a corner of a counter service restaurant does not make for a relaxing retreat. 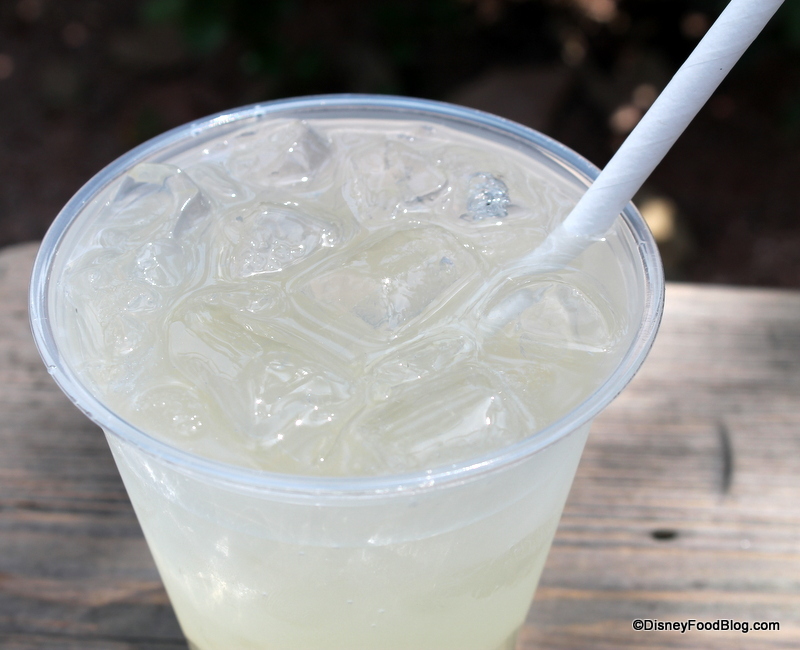 We’ll give you our full thoughts at the end of this article, but first — some details… . 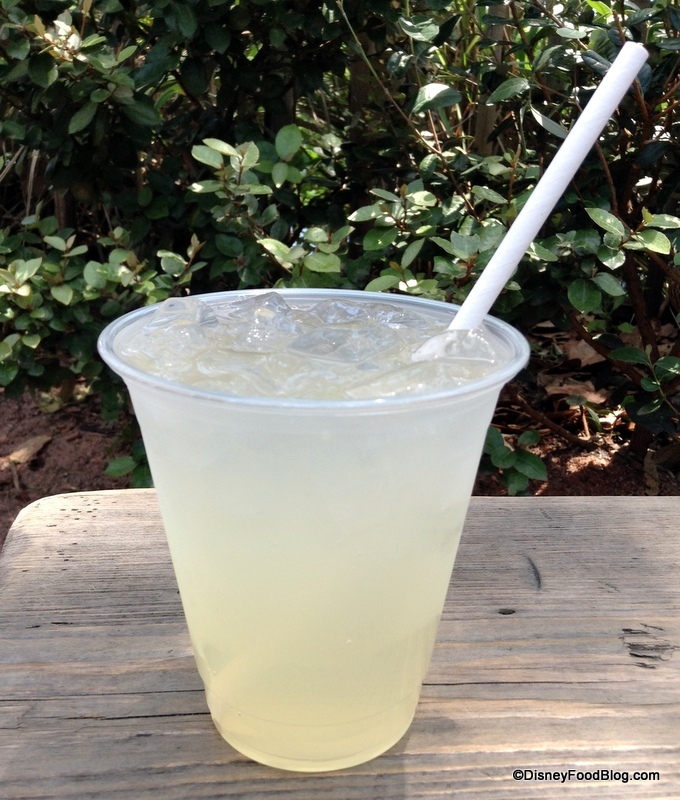 Review: Poison Apple Glow Cube Drinks at Walt Disney World’s Disney Springs! 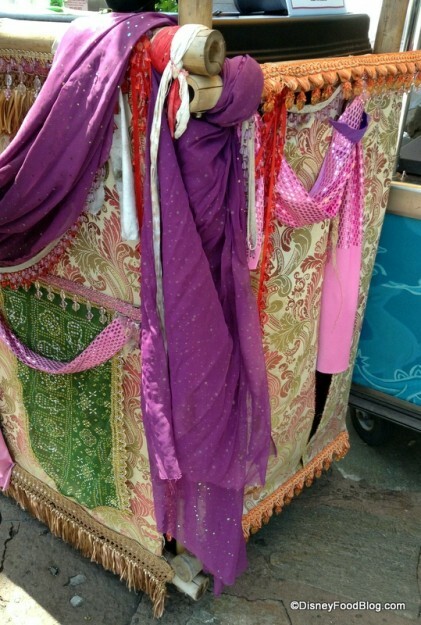 It’s Halloween in the Disney Parks, and if you think Disney Springs was letting everyone else have all the fun, you’ve got another think comin’! 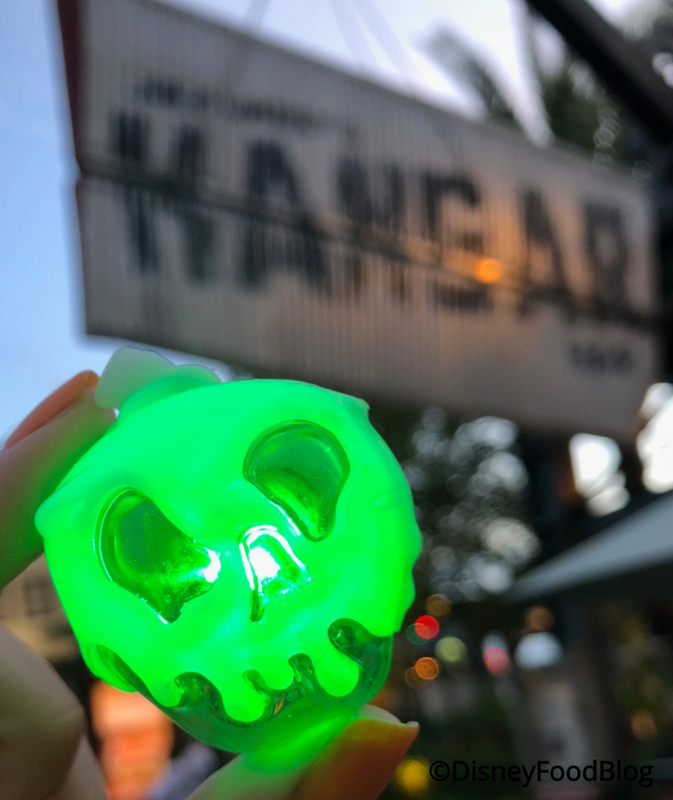 Because right now at Jock Lindsey’s Hangar Bar, a trio of drinks come with Poison Apple Glow Cubes! 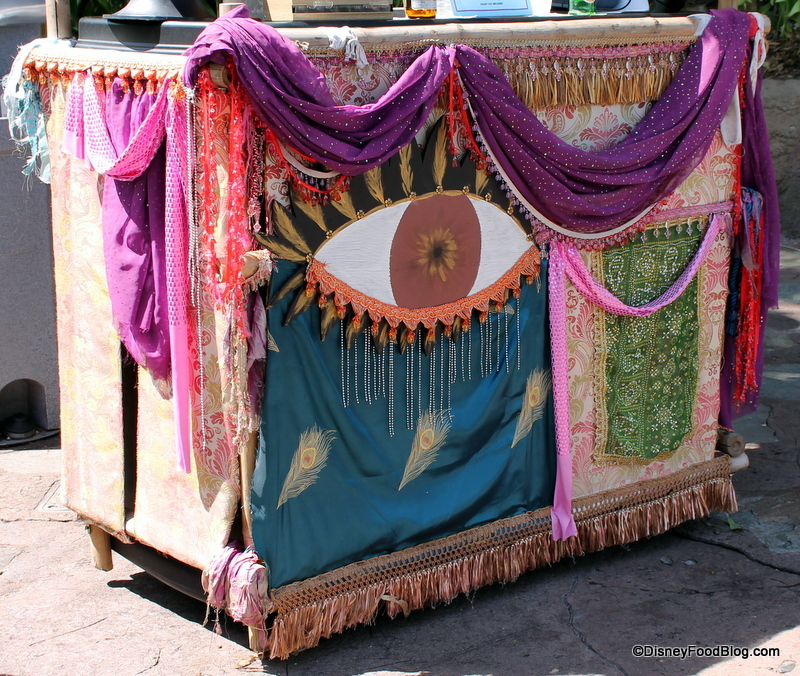 While visiting Animal Kingdom several weeks ago, I noticed something unusual on the path from Expedition Everest in Asia back to Africa’s Harambe Village. This random mini bar had popped straight-up out of nowhere! I had to check it out because, even though it’s just a small, portable stand, the cloth decoration covering it is detailed and eye-catching, much like just about everything else in Animal Kingdom. The menu is small, simple, and custom made for those 21-and-over, with two mixed drinks (The Glacier and Kali River Tea) and two beers (Kingfisher Premium Lager and Singha) to choose from. On my most recent trip I decided to give this new spot a quick stop. 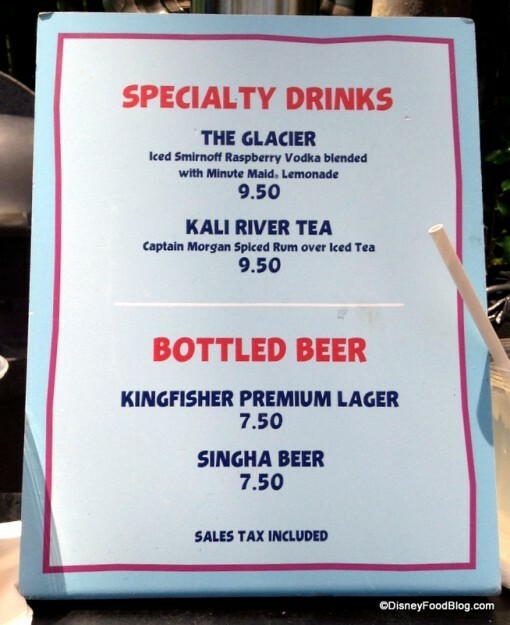 With the FL heat really kicking in, how could I go wrong with something called The Glacier? Fellow blogger and friend Amanda Tinney, who writes Disney Every Day, came across this “extra” bar set up outside Hollywood Brown Derby during ESPN The Weekend — complete with a brand new adult bevvie created for the event — and caught it on film! Thanks, Amanda! 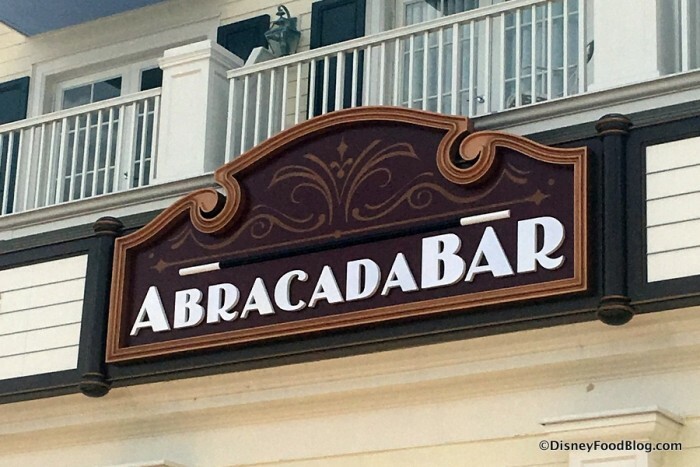 DFB Sarah on DFB Video: Best Disney World Snack Breakfasts!